Welcome to Beads of Perfection. I offer unqiue handmade bracelets, bangles and more featuring charms and beads in a wide variety of styles. Unqiue / One-offs - All items are handmade by myself, making each one unique and slightly different from the next, with variations in colours, charms and beads. Generous Beads - Each bracelet and bangle consists of a generous 15+ charms and beads. Gift Packaged - All bracelets come complete with a pretty organza pouch, chosen especially to match the item. Interchangeable - Charms and beads are removable should you wish to change the appearance or add to your bracelet. 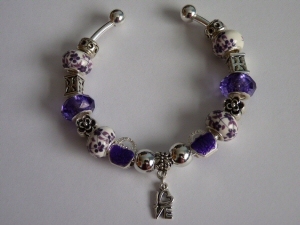 They will also fit onto any other 3mm European charm bracelets you may have including Pandora, Troll, Chamilia, Baggi, etc.. I use Murano and acrylic beads with silver core centre and Tibetan silver / silver plated charms on either a 3mm silver plated snake bracelet with Pandora style clip clasp, a 3mm silver plated snake bracelet with a variety of fastenings and silver plated bangles, also a varying range of colours using faux / genuine leather cord bracelets. Please visit my eBay Shop to see what I have to offer. Bought one of my items? Why not visit my Facebook Page and share your story? Let me know who the bracelet or bangle was bought for and when it was worn. Or maybe post a photo of yourself with your bracelet and matching outfit.